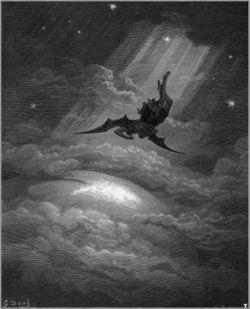 Illustration of the fall of Satan by Gustave Doré, 1866. Satan (Hebrew: שטן, Śāṭān; Aramaic: סטנא, Saṭänä; Greek: Σατανάς, Satanás; Arabic: شيطان, Šayṭān; Ge'ez: ሳይጣን, Sāyṭān; "Name means::accuser, Name means::adversary") is the name of the spirit who is also called the Devil. The name, Satan, means the accuser and the word devil (Greek: διάβολος, diabolos) means slanderer. Jesus calls him a liar and the father (that is, originator) of lies and a murderer from the beginning. He was once included among the "sons of God" as seen from Job 1:6 . Satan is described as "the accuser of the brethren", "a murderer from the beginning" and as "a liar and the father of lies". He is said to "blind men's eyes" and he "prowls about like a roaring lion, seeking whom he may devour". He desires to be worshipped as God and he attempts to draw men away from the true God. As a deceiver and blinder of men's eyes he may be seen as the ultimate source of worldwide movements of ideas, such as long ages and evolution and also of false doctrines within the church. Such ideas are used to discredit the message of the gospel and draw men away from the truth. Their worldwide scope and the devotion with which they are held in the face of the evidence testify to a spiritual power behind them. Many authors of Apologetics or Apocalyptic fiction have capitalized on the use of "el" as the end of the names of angels. The only three angels with names in Scripture are Lucifer (Heyl-el), Michael (Miyka-el) and Gabriel (Gabriy-el). Michael is the only one who is called an "archangel" (Jude 1:9) but is number among the "chief princes" (Daniel 10:13). He is described as the "anointed cherub that covereth", with musical instruments built into his body. The Hebrew word for "covereth" means to protect and to "weave/knit together". As a musical instrument, he was intended to lead worship to the throne of God, bringing (knitting) the holy angels together in a common act of worship. Chronologically speaking, Satan appears very early in the Scriptural record in the post-Flood world (Job 1:6 ). He makes a wager with God concerning Job, which is our first insight into how much Satan is dependent upon God's permission to cause harm to humans. It is instructive however, that God in fact granted Satan permission to harm Job. Jesus said to Peter (Luke 22:31 ) that Satan desired to "sift him as wheat" but that Jesus had prayed in intercession for Peter. The name means "Adversary" (Job 1:6 ). Satan is not an archangel. Only one angel in Scripture is consistently called an archangel, that is Michael, who is also called "one of the chief princes" (Daniel 10:13 ), which we may presume to mean that more archangels exist but we are unaware of them. Satan is not even the most powerful angelic being. We see in (Revelation 20:1 ) that a single angel with a chain is able to capture and bind Satan to toss him into the Abyss. The Scripture formally names only three angelic beings. Each of these names ends with "-el" denoting that they belong to and were personally created by God. Only one of these is known by another name, and that is Satan. Henry Morris in The Long War Against God points out that Satan has been executing on a clear and discernible theme. Satan is determined to prove that God is a liar. Our first encounter with him in the Garden, his first words were to attempt to cast doubt on God's words, "hath God said..?" (Genesis 3:1 ). Morris' conjecture is that when Lucifer/Heyl-el first realized his existence, before him was nothing more than the Creator and a swirling chaos of water. The Bible says that God "found iniquity" in him, the context being a stubborn, willful disloyalty (1 Samuel 15:23 ). Jesus uses this same term in his ministry to describe people who claimed to be doing things in God's name but were actually doing things "their way", a reflection of this same stubbornness and disloyalty(Matthew 7:23 ). Also in this context, Lucifer was high-minded about his own beauty and brightness. Morris asserts that Lucifer's first thoughts were that the water was the origin of all things, including himself and God independently. This explains why he has committed himself to an ongoing campaign to promote evolutionary thought, thematically using randomness (chaos) and physical water as the first point of origin. Also that he claimed he would be "like" the Most High and that he would be worshiped as God. This testimony from God (as to the mind of Lucifer) clearly shows that Lucifer believes himself to be on equal footing with God and just as worthy of worship. He views himself as an independent deity outside of God's sovereignty. God claims to have created him, but he rejects this claim and asserts that God is not his master or creator. In promoting evolutionary ideas, Lucifer is able to undermine God's testimony and authority as Creator, ultimately negating the person and mission of Jesus Christ. This also explains why the mission of the most outspoken atheists is not to prove that God is make-believe, but that Christians are hucksters, liars and delusional. These are pervasive, repeatable themes arising from a common root of origin. Satan physically entered Judas Iscariot John 16:11 . Satan has the ability (although not the unlimited permission) to inhabit the body of humans and control their thoughts and actions. We are told in 2 Thessalonians 2:3 that the son of perdition (also called the Beast or the Anti-Christ) will appear directly after the Rapture. This literally means "son of hell" or "son of destruction", in that Satan will inhabit his body and purport himself to be God. Just as Jesus could say "He who has seen me has seen the Father...I and the Father are one" so will the son of perdition be able to say "He who has seen me has seen Satan...I and Satan are one." In Ephesians 2:2 he is called the Prince of the Power of the Air. Satan was given unusual powers. In Luke 4:6 Satan says he was given power over all the kingdoms of the world for all time, and to give it to whom he chooses, a fact Jesus does not deny. Hebrews 2:14 says he had the power of death and that Jesus came to destroy him as such. In Jude 1:9 it says Michael the Archangel dared not bring an evil accusation against Satan when they were arguing over the body of Moses, saying only that the Lord rebuked him. In Job 1:7 and again in Job 2:2 Satan is asked by God during a gathering where he had come from, and his answer is that he had been "roaming through the earth and going back and forth in it." He appears to have access to heaven (Job 1:6), where he is able to make accusations to God about men. He has control over other evil spirits. However, any power he has is only by permission of God; the dualistic idea that good and evil are balanced is quite false. Satan is also referred to as the tempter, a role exemplified in the temptation of Jesus in the wilderness. Jesus shows the best way to resist temptation, by using the word of God. Satan and his angels are able, within the limits of God's permission, to oppress Christians , particularly by using unredeemed men against them. However, they have no power to affect a Christian internally or spiritually, except insofar as God allows them. A believer can give them opportunity by turning their eyes aside from Jesus and by entertaining sin. Believers who have directly engaged in satanic practices such as speaking to demons, attempting to contact the dead or worship of occult entities have like Job, have had their lives ruined. As God did with Job, he is able to restore and bless a repentant heart. All across America on Halloween night, Christians decorate their homes in honor of what Satan-worshipers call the "Black Sabbath" or "Satan's Sabbath", Halloween night. The "Satan's Mask" (Jack-o-Lantern), morbid pictures, dolls, and even witches and spirits are put on display to elicit fear, dread or comedy in the name of "fun". These images and themes would not be allowed near a Christian home in any other context. Deuteronomy 18:9-13 When thou art come into the land which the LORD thy God giveth thee, thou shalt not learn to do after the abominations of those nations. There shall not be found among you any one that maketh his son or his daughter to pass through the fire, or that useth divination, or an observer of times, or an enchanter, or a witch, Or a charmer, or a consulter with familiar spirits, or a wizard, or a necromancer. For all that do these things are an abomination unto the LORD: and because of these abominations the LORD thy God doth drive them out from before thee. Thou shalt be perfect with the LORD thy God. On a casual observation, one can see the obvious, that the deep-breathing is the initiation of an oxygen delirium. One who practices this is not being filled with spiritual power, but with oxygen! Poorly educated persons, or those who are simply willing-to-believe, are easily deceived by such practices. In many houses of worship in America and throughout the world, demonic ecstatic speech has leeched into regular practice. The critical problem with this approach is in the deliberate deviation from the guidelines for such practices as outlined in 1 Corinthians 14. For example the practice of tongues is designated as a sign for unbelievers (1 Corinthians 14:22 ), but many of these churches practice it as a sign to believers only. In deliberately deviating from the rules, these churches are committing a form of rebellion, which God says is like the sin of witchcraft (1 Samuel 15:23 ) and have opened themselves up to demonic influence. At the end of this age, Satan will be cast down to earth (Isaiah 14:12) and then imprisoned in the bottomless pit during the millenium. After he is released for the final battle, he will be cast for ever into the lake of fire (Revelation 20:10). Hell is therefore the place of his final punishment, not something that he controls or rules. This page was last modified on 21 April 2015, at 15:01.